A very old indicator that measures the magnitude of speculation on Wall St. is the volume ratio between the NYSE and the OTC market. This ratio hearkens from the early days when Nasdaq was the over the counter market where smaller and riskier securities traded. This was before the time of Microsoft (MSFT) and Intel (INTC) - bellwethers of both the stock market and the US economy. Today it would be more apt to substitute the Pink Sheets OTC BB market instead. Even so, for some reason the volume ratio still holds and has flagged important market tops. Including the start of the bear market in October 2007. There is no absolute level however in this ratio that can give us oversold and overbought readings. As with all analysis of volume, we have to contend with not only a seasonal pattern, but also a continuous increase of trading over time. Since we are looking at a ratio, most of the upward creep in volume should be canceled out. Right now, the volume ratio is extremely high and points to a lot of froth in the market. We’ve seen other signs of this in the sentiment data as well. To play devil’s advocate, the ratio could be higher because of the Nasdaq’s leadership (it has rallied much more than the NYSE since March 2009). This is a fabulous indicator that has fallen out of favor but that’s one thing that makes it great. The other is the fact that it doesn’t often generate signals. Regarding the fact that Nasdaq stocks have been in favor since the March lows, I would point out that they were also the “favorites” at the 2000 top. On April 27, 2000 Naz volume as a percent of NYSE volume was 223% (10 day average). We have seen levels this high “intraday” the last few trading days. So popularity for NAZ stocks doesn’t render this indicator less viable. It sure worked well in 2000.
tradeprn, thanks, a comparison to 2000 is scary indeed. This indicator is very useful and a handy way of circumventing any of the usual volume handicaps like seasonality (since it is a ratio). actually, I incorrectly typed the date…… should be April 20, 2007… but 7 days earlier makes it even better. wait, I’m confused, is it 2000 or 2007? sorry, April 20, 2000……… not 2007. I obviously need to proof-read. But as I’m back on this post, I’ll add more color. I have volume data for Naz and NYSE back to 1994- source WSJ. Based on my data, there have been only 4 times between 1994 and now that the 10 day avg Naz/NYSE vol ratio exceeded 190%. Those dates are 11-26-99, 3/31/00, 12/29/00 and 6/9/09. Four signals in 15 years, that’s what I mean by rare. The Nov 99 signal worked- the Dow fell about 6% in 4 days - but then the Dow surged higher. So traders would have had to be nimble. The other dates yielded much greater returns for put buyers and short sellers. 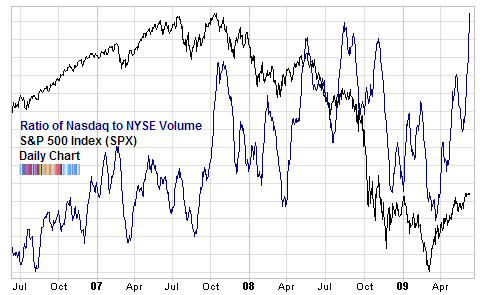 Now if you skip using the 10 day average, the percentage of Naz Volume: NYSE vol on 3-23-00 was 215%– just two days and a few points away from a nice plunge.